There are approximately 2 million adults with reported vision loss in the United States.1 Independent travel and active interactions with the surrounding environment present significant daily challenges for these individuals, ultimately reducing quality of life and compromising safety. To begin to address these challenges, the Federal Highway Administration's (FHWA's) Exploratory Advanced Research (EAR) Program funded three research projects to examine new technology solutions for wayfinding and navigation guidance for people with vision impairment and other disabilities. Exploring and developing situation awareness and assistive navigation technologies is the goal of the EAR Program project, "Intelligent Situation Awareness and Navigation Aid for Visually Impaired Persons." The first phase conducted by City College of the City University of New York, involves the exploration and development of situation awareness and assistive navigation technologies that can provide visually impaired persons with obstacle avoidance and intelligent wayfinding capabilities in indoor environments. The second phase of this project will refine this technology and extend the research to outdoor pedestrian environments. The aim is to provide blind users with waypoint navigation, path planning, and advanced warning of events by using Global Positioning System (GPS), geographic information system, and intelligent transportation system (ITS) infrastructure. The research team is developing a system that can recognize and detect stationary objects; read and recognize important text and signage based on a user's query; and detect, track, and represent moving objects and dynamic changes. The system includes wearable sensors, such as cameras, three-dimensional orientation sensors, and pedometers, in addition to a display unit that will provide auditory and tactile guidance. The system will be able to generate and update a navigation map, register landmarks in the map, and generate a verbal description or tactile feedback for blind users to obtain a richer global perception of their environment. Another EAR Program project investigating guidance solutions for visually impaired persons is " Navigation Guidance for People with Vision Impairment." 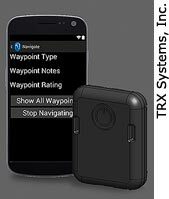 This research project, conducted by TRX Systems, Inc., involves the development of a navigation aid that will be able to track the location of a user anywhere, including areas where GPS is not available. Such a tool will help to increase the mobility of people with vision disability by providing them spatial awareness for long-path planning and guidance. The system uses sensors in smartphones, combined with a small wearable accessory, to track the user's movements, infer map information, and discover key sensor signatures as the user creates a route. The system can store information from the ITS infrastructure that is accessible by standard smartphones with the route to facilitate use of public transportation systems. The researchers are also developing tools that enable users to rate routes for difficulty and share routes with other users. Later, when a user wants to follow a saved route, the recorded route information can be used to provide audible or textual route guidance. In addition, the system can provide automated validation during transit that the user is on route or has reached a desired waypoint both indoors and outdoors. The crowdsourced routing data contributed by users with vision disability will become a source of accessible navigation information, enabling people with vision disability to confidently travel in new cities. form part of Auburn University's pedestrian navigation system. Extending the mobility event horizon (i.e., looking further ahead in time and space) to assist a blind or visually impaired person when navigating in large unstructured environments is the goal of another EAR Program project, " Extended Event Horizon Navigation and Wayfinding for Blind and Visually Impaired Pedestrians in Unstructured Environments." 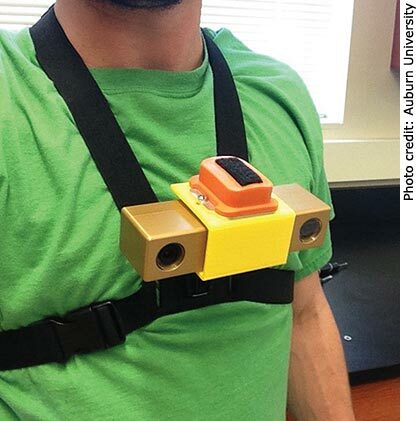 This research project, conducted by Auburn University, is focused on the development of a navigation system that can present information to a visually impaired user when it is critical and needed, whether they are indoors or outdoors. The system is designed to fill the many gaps where GPS navigation is not sufficient, such as in parks, airports, intersections, and general pedestrian zones. The system will provide accurate wayfinding assistance by using a combination of broadband wireless technology, computer vision, and inertial sensing technology. A specialized pedestrian navigation device, known as the pedestrian extended mobility system, integrates GPS, inertial measurement units, and stereo visual odometry to accurately capture the movements of the pedestrian user. Where GPS is not available, the inertial measurement units and stereo visual odometry can be used to continue to provide accurate positioning. An effective human–machine interface forms a key component of this research to ensure that all the geolocation signal status information can be transformed into useable information for the user. The EAR Program plans to continue support for these projects through 2015 and expects to demonstrate the potential benefits of prototype systems. Moreover, additional investment could result in the development of commercially available systems comprising a combination of software for smartphones and accessory devices similar to those currently sold for self-monitoring or exercise and physical activity. In addition, the integration of local low-cost sensors, such as those found on smartphones, wireless data, and strong algorithms could provide safety and convenience benefits for a range of travelers. New methods for conveying situational awareness that limit distraction from the task of maneuvering through dynamic environments will provide fundamental benefits across a range of travelers, whether on foot, on a bicycle, driving a motorcycle or car, or operating a commercial vehicle. For more information on these projects, visit www.fhwa.dot.gov/research/tfhrc/projects/projectsdb/. FHWA's Exploratory Advanced Research (EAR) Program focuses on longer term, higher risk research with a high payoff potential. The program addresses underlying gaps faced by applied highway research programs, anticipates emerging issues with national implications, and reflects broad transportation industry goals and objectives. Bell, E. C., & Mino, N. M. (2013). Blind and visually impaired adult rehabilitation and employment survey: Final results. Journal of Blindness Innovation and Research, 3(1). Retrieved from https://nfb.org/images/nfb/publications/jbir/jbir13/jbir030101abs.html.